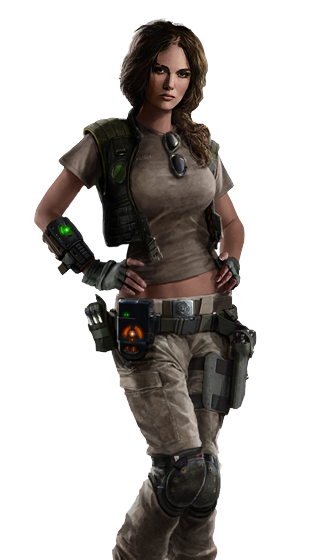 The Acid is one of the many Pistols in the Evolution: Battle for Utopia game. My scientists have studied the remains of the creature called Overlord and constructed an acid-shooting pistol. Its bullets can erode the strongest armor! It`s the Overlord, the most hideous creature on Utopia! I would add that among all the life forms we ever met here this is one of the most both difficult and interesting for the research. We are facing a creature with the unique physiology being able to produce dangerous parasites at an amazing rate and then to control them! Figuratively speaking, the Overlord use the parasites as its soldiers being itself a kind of headquarters and the army training center at the same time. There is nothing equal on Earth. We are dealing with the evolution peak of similar biological systems. Now this creature being so unique, maybe we can make a profit of studying it. I`ve carried out a visual study and got promising preliminary results. 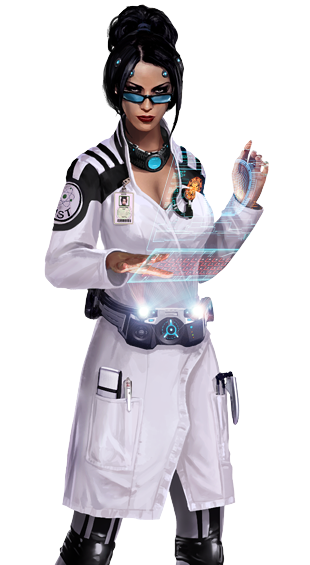 I think when I`m through, we`ll be able to use the study data for the creation of a pioneering organic acid-shooting weapon. 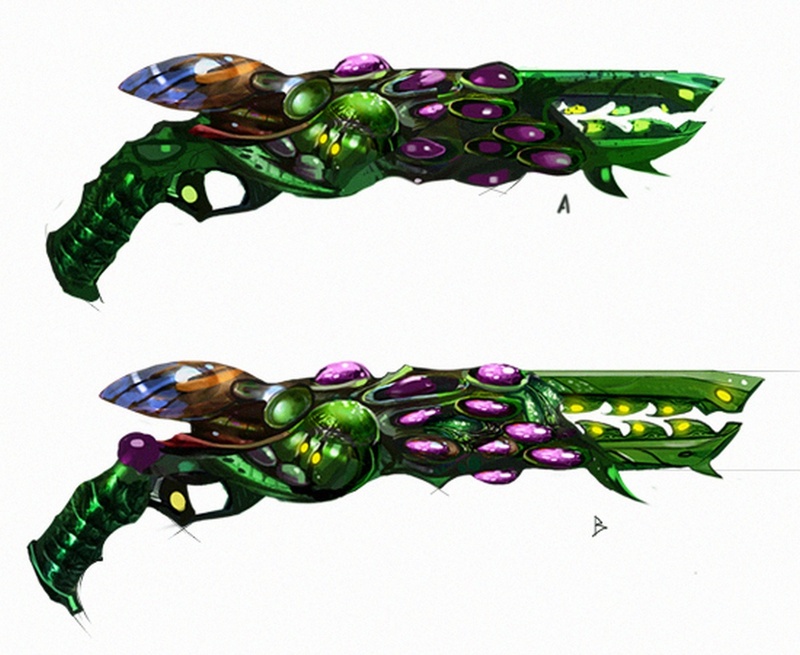 A first-of-its-kind weapon created with the use of Xi-creatures` technologies. The Acid Pistol can deal 28/48 (Min/Max) of damage, has 6/16 (Min/Max) of magazine size and 0/15 (Min/Max) of critical chance. Acid Pistol can be upgraded or dismantled at your Workshop. 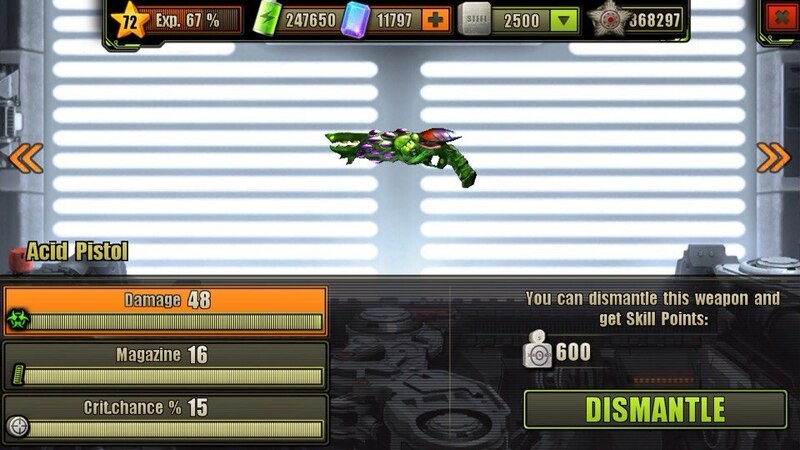 Full upgrade cost for Acid Pistol is 3750 , 165 , 7500 and 01:18:00 of time. Is this pistols damage the same as regular pistol’s damage? Or 28 of acid damage is more than 28 of regular damage? Damage from the single hit is the same! So what is the advantage of having such a pistol (or any other like Dragon, for example) if the damage is the same and they are way more expensive? Sorry to reply here but I don’t know if it’s possible to send you a private message. I have made a video fighting Maximus turret Boss in Black Legion Base. If I send you the video (youtube), can it be posted in the Maximus Boss Walthrough??? As the other that is already there? ONLY good reason is the fact that it can attack armored targets for full (actually 130%) damage, whereas bulldog and “normal” pistols cannot damage armored targets at all exept for aimed shots. i am level 14 atm…. did most of the farming at 13 though– level 13 only “armored” enemy from the terror missions is L4 terror shield guy. i could clear all of them out without using single healing and for most part only with pistol. I’ve also fully upgraded already 2 weapons. Buldog Pistol that I used a lot and also Storm AR which is the most powerful weapon I have so far. I’m now upgrading Dragon Pistol (already did the 1st upgrade till max damage) and I’m doing now the critical chance after have done 1 upgrade to have 8 shots in a row. After I have completed critical damage I’ll finish the magazine upgrade. But it’s also hard to get the skill points. Ok, I’ve just finished to fully upgrade my Acid Pistol but I still can’t take down Hydras using it and U2 medpacks and G2-Frags… I think I need a lot more of practice! Or better, I can take them down, the problem is the rest of the units that comes along after the turret! I’ve answered your other comment. Also, are you planning to take Rico? He might be usefull against armored enemies. I’ve not researched Rico yet! I was trying to make some stock of resources to finishing to build my 6 Black Hydras and I was trying to keep me as low level as I can until they are all built (only 2 Black Hydras are missing). I also have enough skill points to research Maximus turrets but those will be built later because I think my Storage Depot is not still big enough to build Maximus Turrets (missing a few hours to finish researching level 10 of Storage Depot). Many people think that turrets helps attacking player to prepair for the final commandor coming out. What about me, I have only 5 Hephestus and 1 Hydra. And, having a Moloh machine gun, I see that my demage in defense is about equal when opponent meets my Hydra, or when he meets me from the start oh the battle. I’m planning to build Black Hydras and I think it’ll be enouth. Maximus is a very powerfull turret, but it has a weackness to born three bombers after death. I use this moment to wait for all my abilities to be ready and enemy’s Commandor usually has no chances. I think Black Hydra is much better in this way. I think I didn’t understood what weaknesses you said Maximus turrets has! And you think that Black Hydras are enough until, let’s say, from here to (not until the very end) a long time forward in the game ? I’ll answer you in the PVP theme, OK? Sure! Let me look where’s PvP theme! It will be more logics if acid pistol is created by bomber queen ! Il faut tuer le Maitre (overlord) en face à face quand il attaque ta base, il ne faut surtout pas utiliser le missile phénix.